Description: Terrestrial herbs, sympodial; roots filamentous; tuberoids paired and often also produced at apices of stolons. Leaves basal or scattered along the stem, several per shoot, convolute, petiolate or sessile. Inflorescence racemose, 1–several-flowered, terminal; flowers resupinate. Dorsal sepal adherent to lateral petals to form a helmet (galea), about as long as lateral sepals. Lateral sepals basally fused, often erect and embracing the galea. Lateral petals shorter or rarely longer than dorsal sepal. 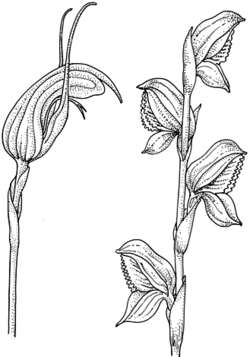 Labellum free, attached to column foot by a short, irritable claw; lamina not lobed or less frequently 2[–4]-lobed, usually with a basal appendage and sometimes with a terminal knob. Column lacking free filament and style; column wings fused to column, expansive in upper half, where they are usually 2-lobed, broad. Column foot much shorter than column. Anther erect to incumbent, persistent. Pollinia 4, soft and mealy. Stigma entire, situated at about the middle of the column. Rostellum ventral. Distribution and occurrence: World: c. 120 species, Australia, New Zealand, New Caledonia, New Guinea. Australia: c. 100 species (most species endemic), all States except N.T.